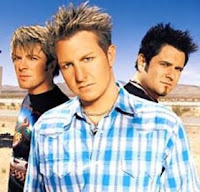 In an example of what might be the future of the music business, country hit makers Rascal Flatts have entered into a 2 year sponsorship agreement with JC Penny. As part of the deal, the band will even create a custom Penny-inspired track for their next CD. The track is called "American Living" and seems to gratuitously promote the American Living brand sold by JC Penny. The song will be on a special album to be sold exclusively at Penny stores, and an American Living branded tour that begins in June. This deal seems a bit over the top in terms of what an artist will now stoop to for a sponsorship deal. Back in the 60's and 70's, such a deal would be unthinkable as a blow to artistic integrity, but it just seems like business as usual in the new music industry. It's understandable that artists are looking for additional revenue streams given the new music economics where CD sales are so small, but such a blatant sponsorship might provoke a backlash that the band is not prepared for. As you know if you read this blog daily, marketer extraordinaire Seth Godin (who also has one of the most widely read blogs on the Internet - I read it every day) has written one of the most influential books in recent memory called Tribes: We Need You to Lead Us . A tribe consists of members who are passionate about something, with their leader being the most passionate. In the case of music, the artist is the leader of the tribe and the tribe consists of the most passionate fans (sometimes called "superfans" or "superfriends"). The gist of the book for a musician is that in order to be successful, you have to develop your tribe and communicate with it regularly. I'll have a lot more on this in my upcoming book "Music 3.0 - A Survival Guide for the New Music Industry", which I'll discuss periodically in the coming posts. Here's a brief interview with Seth discussing tribes, among other things. As a follow up to my previous post about sinking DVD Sales, new information that shows just how severe the decline is has now come to light. The Wrap states that DVD sales at Warner Pictures were down by a whopping 24% last year, and Fox by 14%. Even Disney with its built-in kid audience was down by 33%!!! While the sales figures are no doubt causing hand-wringing in boardrooms all over Hollywood, it appears that the format isn't completely doomed. The rental outfit Netflix reported a 45% increase in profits last year based on 26% more subscribers. So what does all of the above really mean in the grand scheme of entertainment? Perhaps it's the economy or perhaps it's the changing face of technology, but consumers don't want to own DVDs anymore. Sure they want to watch the movie, but it's better to pay the $5 (or less) rental fee than to buy an item that you might watch only once. As far as Blu-Ray sales, yes, the format is gradually on the rise but won't be the saviour that the studios hope it will be. It only offers better quality, but any new format that replaces an older one offers convenience too, and that's not something you'll find with BD. With Internet speeds getting ever cheaper and faster and on-demand cable channels finding more viewers, consumers are saying they could care less about the DVD extras that used to be packed onto every disc, so there's no real need to own it. Just let me watch the movie once and then move on. 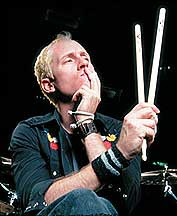 Josh Freese, drummer for Nine Inch Nails, Devo, A Perfect Circle, Sting, and the Vandals, has taken a page out of the Trent Reznor (his boss in NIN) playbook with a unique multi-price strategy for his new album Since 1972. With prices from $7 to $75,000 (that's right - no misprint), there's literally something for everyone, although you have to wonder just how serious some of the more expensive offerings really are. Makes for good copy though. -"Thank You" phone call from Josh for buying Since 1972. You can tell him what you like about the record that you purchased, or what you thought sucked. Ask whatever you want, like "Is Maynard really THAT weird?" or "Which one of Sting's mansions has the comfiest beds?" or "Are Devo really Suburban Robots that monitor reality or just a bunch of Dads from Ohio?" or "Why don't the Vandals play more stuff off the first record?" It's your 5 minutes to yack it up. Talk about whatever you want. -Signed Drum Head and Drumsticks. -Signed Cymbal, Drum head and Drumsticks. -Josh washes your car OR does your laundry....or you can wash his car. -Pick any 1 member of the Vandals or DEVO (subject to availability) to accompany you and Josh to either the Hollywood Wax Museum or the lunch buffet at the "Spearmint Rhino"
-Josh writes about a song about you and make available on iTunes. -Co-direct a video with him for the song about you and throw it up on the youtubes. -Get drunk together. If you don't drink we can go to my Dads place and hang out under the "Tuba tree"
-Stone from Pearl Jam will send you a letter telling you about his favorite song on "Since 1972"
-Signed DW snare drum from A Perfect Circle's 2003 tour. -Twiggy from Manson's band and Josh take you and a guest to Roscoe's Chicken n' Waffle in Long Beach for dinner. -At the end of the day at Disneyland drive away in Josh's Volvo station wagon. It's all yours....take it. Just drop him off on your way home though please. -A signed drum from the 2008 Nine Inch Nails tour. -Josh gives you a tour of Long Beach. See his first apartment, the coffee shop on 2nd St where his buddy paid Dave Grohl $40 to rip up tile just weeks before joining "Nirvana." See the old Vandals rehearsal spot, the liquor store he got busted using a Fake I.D. at when he was 17 (it was Dave from the Vandals old ID). Go check out Snoop Dogg's high- school. For an extra 50 bucks see where Tom and Adrian from No Doubt live. For another $25 he'll show ya where Eric from NOFX and Brooks from Bad Religion get their hair cut. -Pick any 3 items out of Josh's closet. -Take shrooms and cruise Hollywood in Danny from TOOL's Lamborgini OR play quarters and then hop on the Ouija board for a while. -If you don't live in Southern California (but are a US resident) he'll come to you and be your personal assistant/cabana boy for 2 weeks. -Take a flying trapeze lesson with Josh and Robin from NIN, go back to Robins place afterwards and his wife will make you raw lasagna. 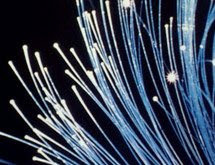 Here's an interesting slide show from PBS's Nightly News Report illustrating the top 30 innovations in the last 30 years. It's short and fast, but you'll be surprised at just how many daily-use items that we take for granted are on the list. Any ideas for the next 30?